It’s been a long time since I read comics. Growing up in the UK, my favourites were in no particular order, British comics like the Beano, The Dandy, The Beezer and The Topper. These were popular kids fodder with memorable characters and alliterative names such as Desperate Dan, Biffo the Bear, Minnie the Minx and so on, others had (correct me if I’m wrong please) homophonic (?) names like Dennis the Menace, Rodger the Dodger etc. My favourites were General Jumbo, a boy with a remote controlled wrist device that brought his army of miltary toys, (soldiers, tanks, helicopters etc) into life and helped him in his adventures. Another intriguing character (flawed of course) was the ‘Steel Claw’ a secret agent who became invisible apart from a steel hand that had replaced his own human hand, lost in an accident. From a kid’s perpsective it was ingenious….invisibilty! From an adults point of view, flawed because….well….you can still see his disembodied steel hand!!! So much for covert espionage then eh? I was never much of a ‘Hotspur’ comic fan (Named after an English football team, because I hated sport and it was a football orientated comic. Now, as a Scottish child growing up in a working class area in the lowlands, I never saw any teacher wear the gown or Mortar Board…or for that matter, carry the cane. These were purely, to my mind, alien! But here’s the rub! The makers of these comics were the Scottish based, Scottish ran family firm of DC Thomson, based in Dundee. One wonders why then, they didn’t have a Scottish version of their comics. Perhaps they felt a broader anglified version could be published in all of the UK, but again, the strange thing…they published a very much loved and well known paper (still in circulation) called The Sunday Post. The post was a heavily sanitised ‘nice’ wee paper..inoffensive and more likely to suit your granny or conservatively minded genteel folks who still hearked back to an age in Scotland, long past or one that possibly never actually existed except as a fiction. In the Post, there were always two full pull out sections featuring two well known or as we say in scots, ‘weel kent’ characters, one, a family, The Broons (The Browns) and the other, a cute little urchin and prankster, Oor Wullie (Our William) who was featured sitting on an upturned metal bucket, known as a pail in Scotland. These characters were a big hit in Scotland and they naturally evolved to having yearly annuals every Xmas time (I think from the 30s or 40s onwards) so they have been on the go a long time. The other more ‘anglified’ aforementioned comics and certain characters also had annuals dedicated to them by Thomson. Moving on….my next foray into the world of comics took me to the USA…not geographically of course. I fell in love (big time) with the MAD magazine. I was totally fascinated with the boyish charming, gap toothed, freckled character and main front cover mascot Alfred E. Neuman, but was baffled as to why he never had his own adventures in the comic but seemed forever destined to remain a poster boy, advertising, from his picture, what that issue’s main topics were. I ‘found’ a new style of art in the kooky characters of Don Martin whose exlpoits always had me in fits. MAD magazine was very collectable and I had loads of concurrent issues including ferreting out as many small MAD paperbacks as I could too. MAD was essentially a satirical spoof magazine, ridiculing the politics of the USA at the time and although I enjoyed it, it was nonetheless USA-centric. Moving on from humour, I then got into the dark side….with comics like EERIE, STRANGE TALES, TALES FROM THE CRYPT AND FORBIDDEN WORLDS. These were cheap pulp paper mags and the panels were all largely symmetrical. The stories had me intrigued and whetted my appetite for all things strange, weird and spooky!!! I loved ’em and bought tons of them, swapping with other friends who liked them too. As well as these, I loved the superero genre. 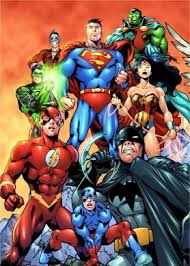 Batman (my favourite) Superman, Green Lantern, Wonder Woman, The Flash etc from the DC camp and the X-Men, Fantastic Four (Cyclops was my favourite) and The Hulk were my main likes. Strangely enough then, I wasn’t too keen on Spiderman….oh, I forgot to mention Thor…I loved Thor with mjolnir, his mighty hammer. So….that was my ‘comic consuming’ upbringing and up until recent years, I never read another comic again. How I came to begin reading comics again as an adult was through seeing some graphic novels in my local library. I decided, after leafing through some, to take them home for a browse. Well….talk about quantum leap….these things were light years ahead of the old comics in terms of cultural advancement (subject matter, what was allowed) and artwork. ARTWORK and STORY: The artwork was PHENOMENAL!!! Colours vibrant and gone were the old style symmetrical panels, to be replaced by all weird and wonderful shapes that added to the frisson of the story. Stories too were much more adult and sophisticated and weren’t confined to the superhero genre but covered a broad range of topics and issues from the classics, to crime, war, sci fi, fantasy and the supernatural, so there was plenty to choose from. As a book reader, I know, from certain quarters that graphic novels were first viewed as for children or at least a sub standard way of reading. How wrong they were! I found the comics engaging, thought provoking and highly entertaining. E-READERS, WHICH ONE TO CHOOSE? I now needed an e-reader to view my comics on, but which to choose. That was fairly simple for us in the UK, because a good few years ago, the only choice we had, was the over-hyped and grossly over-priced ipad which came with limited memory capacity and if you wanted more….then you had to fork out buddy! For a few years I scouted out the e-reader market but nothing was forthcoming for the UK. Anything that did come out, was geared to the states. Then at last, came the pioneer rival to the ipad…the KOBO VOX! Made by KOBO and partnered by British stationer giant, WH Smith, it hit the UK marketplace, beating rivals, the Amazon Kindle and the Barnes & Noble Nook to the punch. What I loved about the Kobo Vox, was that it was a ‘colour’ e-reader. Nothing like it (apart from the ipad) was available in Britain at the time. Amazon’s Kindle was only black and white and they and B & N had no plans to enter the UK market, thus doing themselves no favours in the money stakes by ignoring a whole potential country’s worth of readers. 4GB of storage, but could be upgraded to 32GB via an SD card. It cost me £149.00 (232.850 USD) wich was a fraction of the cost of an ipad yet, could do everything the ipad did. You could read ebooks, newspapers, magazines, graphic novels all in glorious colour. You could social network, watch vidoes or films, play games and download apps from the android store. Unlike the ipad which was heavily ‘censored’ in terms of you got what ‘they’ approved, android marketplace allowed the user to choose what they wanted or not. So, all in all, it was a great investment for me. I’m still using it today and love it to bits. APPLE COPYCAT MARKETING: This is my first criticism of KOBO. I have seen the latest Kobo Vox and it seems the ‘greed’ factor has kicked in with the coy, as now they are copying Apple and hiving off profits by bringing the Vox out in selected GB models, ie, 8 – 16 – and 32….just like the ipad. So I’m glad I bought it years ago. I still enjoy reading my comics and have downloaded the apps from all the good comic producing companies, e.g. X Comics, Dark Horse etc and some of the stories I’ve enjoyed were the Fringe series (tv) and Constantine (film). ps, If you can, get yourself a hold of The Bloody Streets of Paris graphic novel by Jacques Tardi and Louis Malet. Tardi’s artwork is phenomenal….you can almost smell Paris when you look at it, it’s so well drawn.